HVAC (Heating, Ventilating and Air Conditioning) is a technology designed for use in indoor spaces. It's aimed to provide thermal comfort while maintaining acceptable air quality throughout the premises. In order to maintain the efficiency of the HVAC system over time it needs to be cleaned every now and then, which will also allow it to maintain better indoor air quality. At Duct & Attic Cleaning Experts, Huston, we offer cleaning services for HVAC systems to customers throughout the city and its vicinity. The cleaning process of the HVAC system includes removing dust, bacterial contamination, mold growth, etc., accumulated in its ducts, vents, and other parts. This cleaning process directly affects the air quality at your home or any other relevant property, and therefore, you should only hire professionals to do the job, as they are familiar with the cleaning products and procedures recommended by the NADCA (National Air Duct Cleaning Association) and can ensure optimal results. 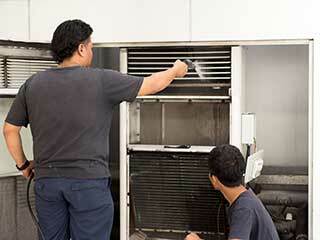 Why Should the HVAC System Be Cleaned? While some can't see the benefits of the cleaning process, it has been proven to allow the system to maintain efficiency over longer periods of time and to reduce operational costs. The U.S Department of Energy's reports show that between 30 to 40 percent of the energy used for heating or cooling goes to waste. Why is that? Well, contaminated HVAC systems or systems that have accumulated a lot of dust and dirt and are blocked, are not working as good as they should. They have to work harder to deliver the same results. Meaning their efficiency is compromised and their life expectancy is shorter. Cleaning the system will allow it to regain full efficiency and will save you money on electric bills. Additionally, cleaning the system will improve the air quality within the building. Think of all the pollutants we produce as humans and as a society, including dust and chemicals, which are all sucked into the system, where they circulate between 5 to 7 times. This can contaminate the system and cause it to reduce the indoor air quality if left untreated. Calling for professional HVAC system cleaning will allow you to save money and improve the system's efficiency, your control over the temperature within the building, and the quality of the air you, and everyone else in the building breathe. For more information contact us and we will be happy to assist!